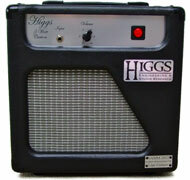 Over the years, Higgs Engineering & Studio Research, a division of Higgs Communications, has produced several prototype guitar amplifiers for client use. These two amps were built specifically for use by Lipe Guitars in their booth (#1018) at the 2012 Winter NAMM Show. If you've ever been to the NAMM Show, you'll understand the problem of getting great guitar sounds (at low volumes) without getting shut down by the noise police. So we came up with two classic sounding amps that only put out 5W. 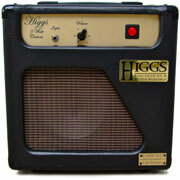 One of the main requirements of any guitar amplifier is to produce good tone. The other requirement, was that they avoid the wrath of the noise police (the NAMM staff wandering around the booths with db meters). So we produced two low-wattage "boutique" amplifiers, to meet those requirements, that were hand-wired with vintage-style point-to-point circuitry. Both amplifiers have the 1957 Fender 5E1 Champ as their heritage. But that's where their similarities end. The 5W Custom Silver is the closest, retaining the negative feedback, although it is voiced more closely after the Bassman. The 5W Custom Gold is voiced after Marshall's higher gain 18 Watt Bluesbreaker amplifier. Neither amp were given tone controls, as this was considered unnecessary. Other: Sozo coupling capacitors, carbon comp, metal & carbon film resistors. Other: Sozo coupling capacitors, vintage Mallory capacitors, and carbon comp, metal & carbon film resistors.